During the summer break, buildings and classrooms at Carden Academy of Maui received new lighting, cooling systems, and other modifications, all designed to create optimum learning environments and healthier classrooms, while also reducing electricity costs. The project was spearheaded by John Bendon, a Carden board member, parent, and the founding principal of Green Building Hawaii. As an example, three outdated window air conditioning units in the kindergarten classroom were replaced with one split A/C unit, saving energy and reducing noise caused by the older units. The old A/C units will be replaced with brand new, insulated, heat reducing windows, to bring in natural light while reducing passive solar heating. Formaldehyde-free insulation, certified for school environments, was installed in many classrooms. Several windows also received tinting, which will reduce heat transfer and result in improved energy efficiency. Lighting was another big focus for the summer project. Each classroom had the lighting optimized to support student learning by providing more uniform light distribution and optimal light levels for classroom environments. LED lights replaced fluorescent ones and energy use for each fixture was nearly cut in half while light levels were increased. The campus already had photovoltaic solar panels in place, and the new changes bring the school closer to their goal of running at net zero for energy use. According to Nellie Foster, the kindergarten teacher, the changes are significant. “My classroom gets cool quickly now, and stays cool throughout the day.” Now that school is back in session, the students and teachers will not only be enjoying their cooler, more energy efficient classrooms, but will be working the project into their curriculum, analyzing and reviewing the changes as part of their science and math courses. Carden Academy’s Pre-K students enjoy the new A/C units and LED lighting! 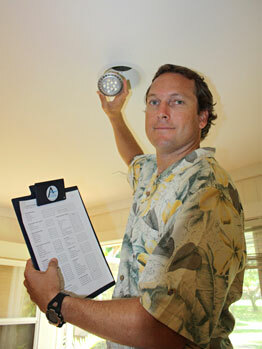 John Bendon of Green Building Hawaii changes out the light fixtures. The project was funded by the last year’s Annual Fund and the annual Jamboree fundraising event, which raised more than $120,000. Carden Academy would like to recognize Haleakala Solar for donating labor to replace numerous light fixtures in Carden Hall, Green Building Hawaii and Advanced Energy Innovations for donating fixtures for Carden Hall, Scotts Cooling for donating an air conditioning unit and Randy Wagner for donating the exterior shade on 6th grade, Electric Service of Maui for discounting lighting installation costs, and Maui Glass Tinting Specialists for discounting window film. 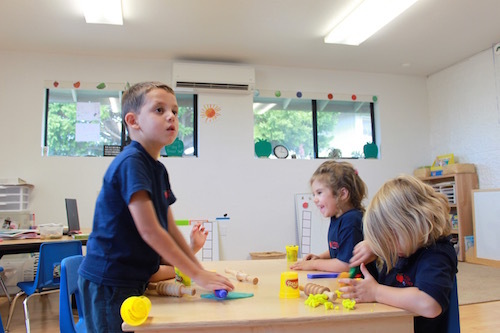 Carden Academy, located in Upcountry Maui, is an independent-private school offering a core academic curriculum and small class sizes for Pre-K through 8th grade. Enrichment programs include Art, Music, Dance, Drama, Foreign Language, and Physical Education. Carden Academy is committed to educating the whole child through a balance of academic excellence, character development, and enrichment through the arts in a nurturing, small classroom setting. For more information, please contact 808-573-6651 or visit www.cardenmaui.org.